Sadly Chesterfields - the second hand book shop in Wimbledon which put out it's Penguin books in a bookcase in the doorway and had the old fashioned habit of putting stock out on the pavement for passers by to consider - is closing down. I walked past on Friday and picked up three penguins for a pound (The Lonely Passion of Miss Judith Hearne, Sober as a Judge and Time of Hope) but restrained myself otherwise. 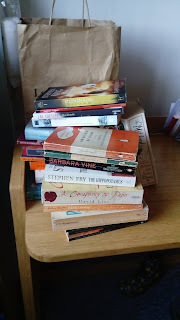 It's too easy to get carried away by bargains when I have so many books unread already on my shelves, to flip from being a reader to a collector, to load myself with the new weariness of more when really I could do with a bit less. That large one on the right is The Mitfords, Letters between Six Sisters. I have a feeling I might get down the bookswap and change my mind about this one. They are very funny as well as being historically fascinating. The Gunslinger, Stephen King, which I reviewed for my 1982 post. I wasn't planning to read the rest of the Dark Tower series, but having lent this book to my brother he borrowed the remaining six books from a friend at work and we're going through them. I'm going to reserve my review until I've finished the lot (I'm on book five now) but despite the occasional wince - King doesn't pull his punches when he's describing horrible things - I'm still reading. I still care about what happens next. The Hippopotamus, Stephen Fry. I read about half of this a few years back. I've read elsewhere that Fry might have been channelling or paying homage to Kingsley Amis, and I think I'd agree with that. I find Amis funny up to a point, and then I find him too dark and bitter. That was true here as well. I could hold onto it a few more years in case I feel the urge to pick it up again, but I could just as easily source it from the library. So off it goes. An Avenue of Stone, Pamela Hansford Johnson - I think I reviewed this one. It's written just after the war and I thoroughly enjoyed it and will probably hunt out others in the series, although I won't read this one again. Foe, J M Coetzee. I read this as part of my OU course. The course was all about intertextuality, and Foe is the story of Crusoe (or rather a riff on the story of Crusoe) from an alternative viewpoint - what you could call the viewpoint of the marginalized. It's a great little book, but ironically I found the link to Crusoe nothing but a distraction and would have preferred it as a stand alone. Life At Blandings by P G Wodehouse. This is an omnibus comprising of three of the Blandings books. Wodehouse is a joy, as always, but I don't need to own him. There are about 20 Wodehouse books on the Wimbledon library shelves alone. A Conspiracy of Paper, David Liss. This is a historical novel which did what so many seem to do, which is throw in a lot of historical facts that no-one telling a story at the time would bother with. I don't want to see the bones of historical research unless I'm reading history, sorry. Possibly that says more about me than historical fiction. A Little Learning, Evelyn Waugh. Autobiography which I enjoyed but won't read again. The Chimney Sweeper's Son, Barbara Vine. This has been sitting on my shelf too long. I've read a couple of books by Barbara Vine and two or three by Ruth Rendell, who is of course the same person. (I got her muddled with P D James for ages as well, so I'm not sure how many of each I've actually read). I tried a few pages to see if it would grab me and make me want to keep it. It didn't. So out it goes. A Man Lay Dead, Ngaio Marsh. A nice green penguin. I've read this book quite a few times - it's joyously silly and involves someone turning a murder game in a country house into the real thing, a Russian dagger, Bolsheviks, a re-enactment of the crime and various other early murder mystery joys. I may change my mind about getting rid of it when it comes to the point. Trent's Last Case, E C Bentley. Another green penguin, not in great condition. An absolute period piece - an even earlier example of crime fiction than the last, when women were apparently so horrified that anyone could suspect them of adultery they couldn't even refute the charge. It made me think of Agatha Christie's bright young thing Lady Eileen 'Bundle' Brent telling Anthony Cade in the 20s. 'Women believe these things - or used to - we've come on a lot in the last 10 years.' Apparently Trent took a long time to make a comeback, so I may have to hunt that one up and see what's changed. The Unseemly Adventure, Ralph Strauss. An orange Penguin this time. I have read this, but forgotten it again. I don't usually forget books so it can't have been at all memorable. Across the Empty Quarter, Wilfred Thesiger, Into the Heart of the Amazon Forest, Walter Henry Bates, and Adventures in the Rocky Mountains by Isabella Bird. These were all part of a set of 'journey' books - mostly small sections from longer books. They are nicely short and very attractively packaged, and some were gems and led me to the longer books. Others are a bit samey, written from the point of view of the white explorer in foreign lands: encounters with wild animals, patronising remark about natives, nothing to see here. Dusklands, J M Coetzee. Again I read this for the OU course. It was hard reading, but eye opening. 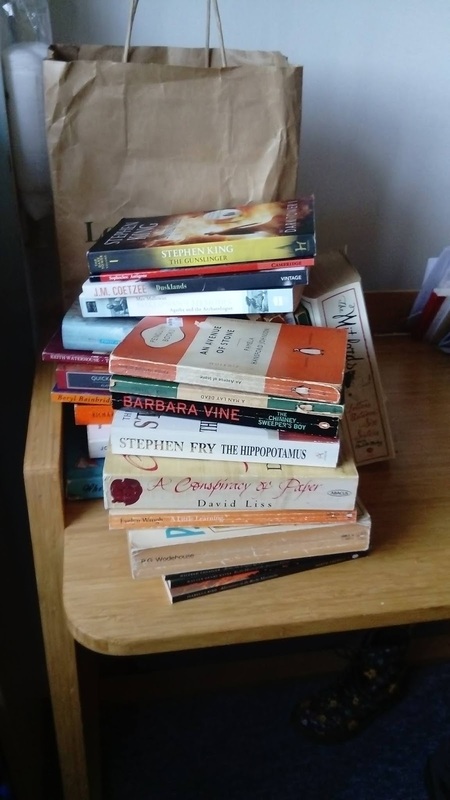 The Theory and Practice of Lunch, Keith Waterhouse, and The Blind Watchmaker by Richard Dawkins, both of which I reviewed last time. Mallowan's Memoirs by Max Mallowan. I think I bought this thinking it would be about archaeology or about Agatha Christie. It's kind of both, but in a superficial way, and goodness is he dry. I suppose being married to a writer is no guarantee of being able to write yourself. Swallow This by Joanna Blythman. This is an excellent book about what has happened to food and food production (for example how there are ingredients that don't have to go on the label because they're part of a processing method that supposedly leaves so little residue it makes no difference). My food activism goes as far as avoiding meat - a decision made due to inhumane farming practices, although I'm aware dairy is not ideal either - but I do like to go into these things with my eyes open.It was my aunt's book, and she doesn't want it back, so off it goes for someone else to read. And the last 4 books are Harriet Said by Beryl Bainbridge, Where I'm Reading From, Tim Parks, Postcards by E Annie Proulx and A Travelling Woman by John Wain. These have all been on my shelves a long time and failed the 'read a bit and consider if I would buy it now' test.